When I was a kid, I loved the show In Search Of. You know the one-it delved into all sorts of mysterious phenomenon and pseudoscience, famously narrated by Leonard Nimoy. I don't think I missed an episode, but the one that really stuck with me was episode 17, "The Easter Island Massacre." I remember watching, rapt with attention, as Nimoy's deep monotone introduced me to this small island filled with giant heads and how they might have come to be there. The day after the show aired, I hunted down Thor Heyerdahl's Aku Aku from the school library and checked it out (and kept checking it out as often as I could, if only to look at the pictures). I was really fascinated with the place, but I never thought I'd ever see these mythical giant heads up close for myself. That is, until my wife and I started planning our year-long family trip around the world. Suddenly a visit to Easter Island was a very real possibility. 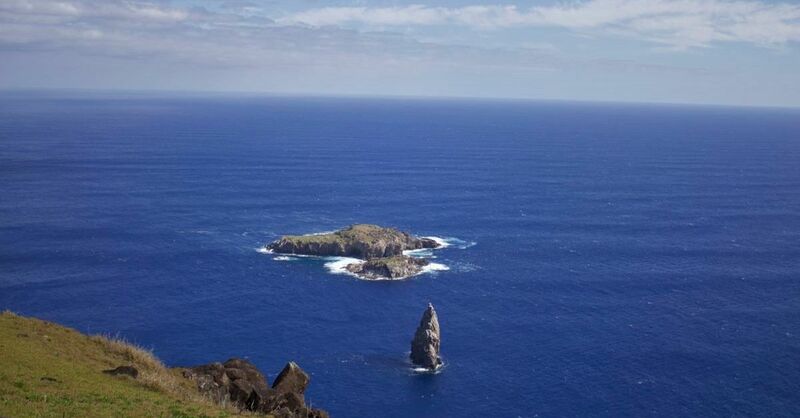 The route to Easter Island, or Isla de Pascua as it's known in Spanish, is not an easy one. You can get there by boat, but that takes awhile, and the only way to get there by plane is through Santiago, Chile. LAN Airlines is the only airline that currently flies to Mataveri International Airport (designation IPC), which is the only airport on Easter Island. Flights to the island leave Santiago daily in the mornings (on LAN 841), except Tuesday. There's an additional flight on Monday evenings (LAN 833), which continues to Tahiti, and another on Friday evenings (LAN 843). And that's it. Well, technically, you can also get there via the once-weekly flight from Tahiti (LAN 836), but to do that, you obviously need to get to Tahiti first. Because there's no real competition, the flights from Santiago are pretty steep, running about $600 or more per person. We managed to get that down to $1,600 for four tickets after cashing in some airline points. Worth noting: if you've coming from a country that doesn't have reciprocity with Chile (including Australia, Canada, and Mexico), be prepared to pay an additional $160 U.S. per person to enter the country. Luckily for us, Chile ended the reciprocity fee for U.S. Citizens earlier this year. 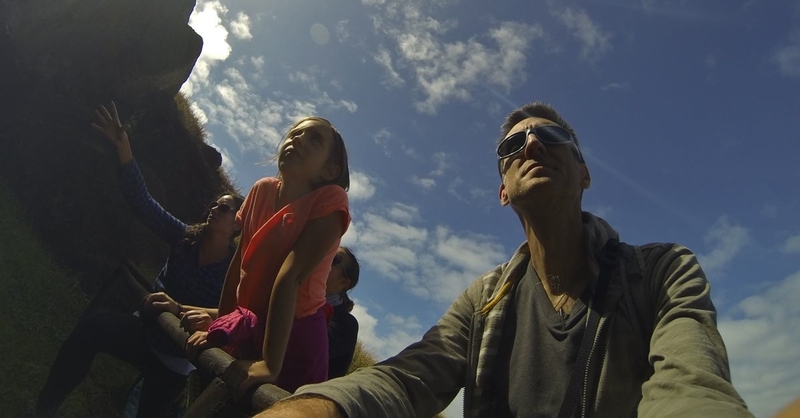 Anytime a flight lands on Easter Island, a small kiosk opens that sells tickets to Rapa Nui National Park ($60 US for adults, $10 US for kids) for a short time. We didn't buy ours when we landed (our plane had been delayed, so we landed after midnight, and we were tired), but it would have saved us an extra trip to the National Park office on the southwestern corner of the island. Without the tickets (which are good for a generous five days) you can't visit the quarry at Rano Raraku (where most of the heads are) or the stone hut village at Orongo. 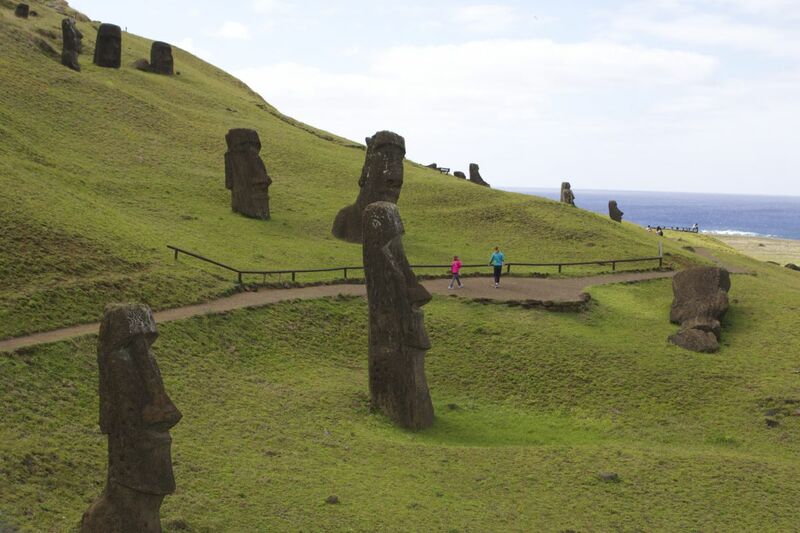 The main industry on Easter Island is tourism, and, as a result, there's no shortage of places to stay. Booking.com boasts listings for 110 hotels in the 60-square-mile island's only town, Hanga Roa, which is home to most of the island's 6,000 residents. At the top end, you'll spend $3,500 US per person per night (three-night minimum stay) in the explora hotel, but we opted for something a little more modest. 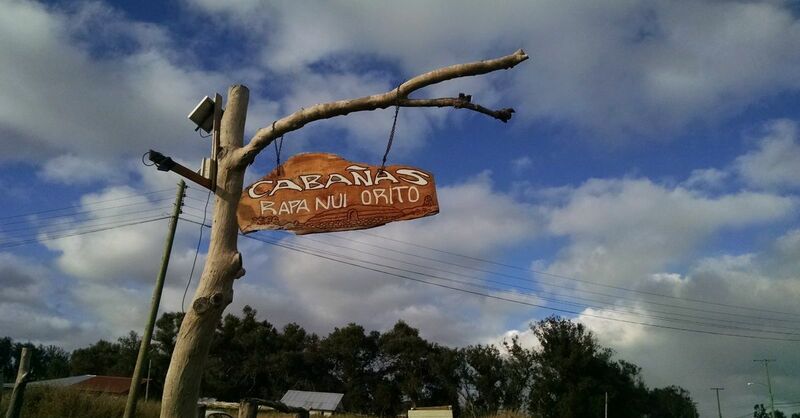 We stayed at Cabañas Rapa Nui Orito, a bed and breakfast-style place a few kilometers outside of Hanga Roa. To quote Dale Cooper, it was "a clean place, reasonably priced." And I'll add to that: with functional wi-fi in the lobby. 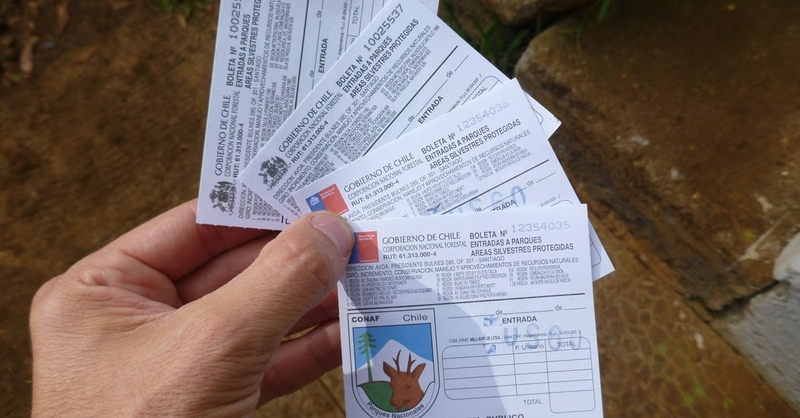 The main form of currency used on the island is Chilean Pesos, but plenty of places take U.S. Dollars. The shops don't give a great exchange rate though, so bring along a good supply of both currencies. If you need more pesos, there are only two ATMs we found on the island, and, as our guide would later tell us, one of them doesn't always work. You don't need a guide to tour the island, but, in our experience, hiring a guide will greatly enhance the experience. Learning about how the giant stone heads were carved. Our style is not that of the large tour group, so we were fortunate that on our first day, Tiare from Easter Island Guides was available. Tiare is a Rapa Nui native who grew up on Easter Island, and she knows a lot about the island's rich history. She was a fantastic tour guide for us, and very kid-friendly - which was great because my youngest daughter asks a lot of questions. Plus, she was really adept at avoiding the large tour groups. We consistently avoided this sort of thing. 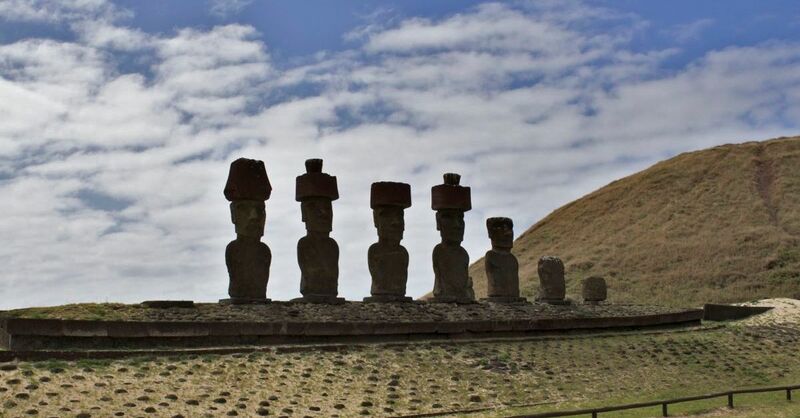 Easter Island is best known for the giant stone heads, called moai, which the aboriginal Rapa Nui people carved as a form of ancestral worship and as a source of mana, a magical power they desperately sought. 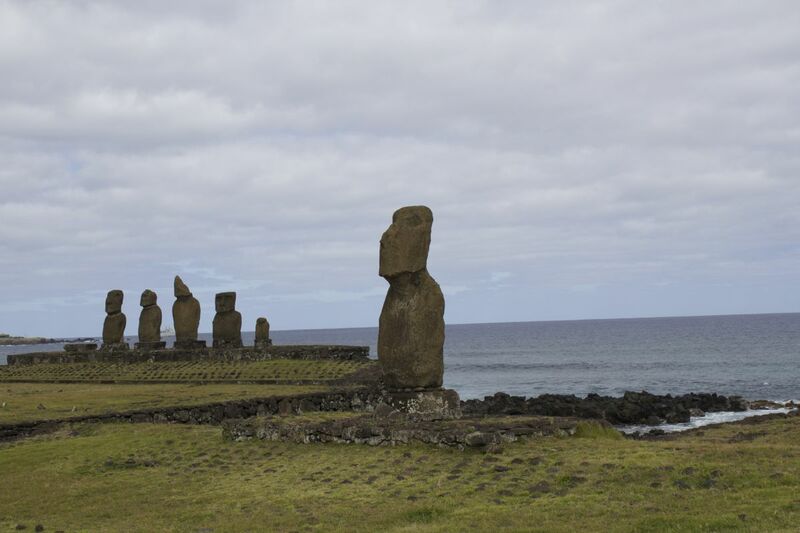 All of the moai, with the exception of those at Ahu Akivi, are placed facing inward so they can watch over their people. Looking away from the ocean, protecting the people. 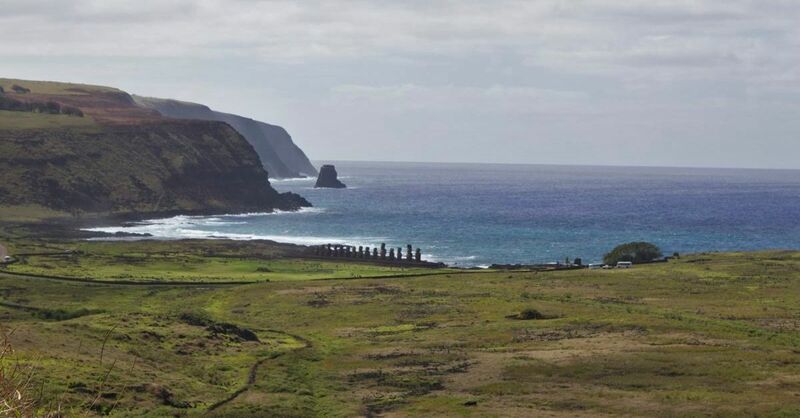 Around 1680, a war broke out among the Rapa Nui tribes, and before it was over, every moai on the island had been toppled over. Most of the time, these broke when they smashed into the ground. 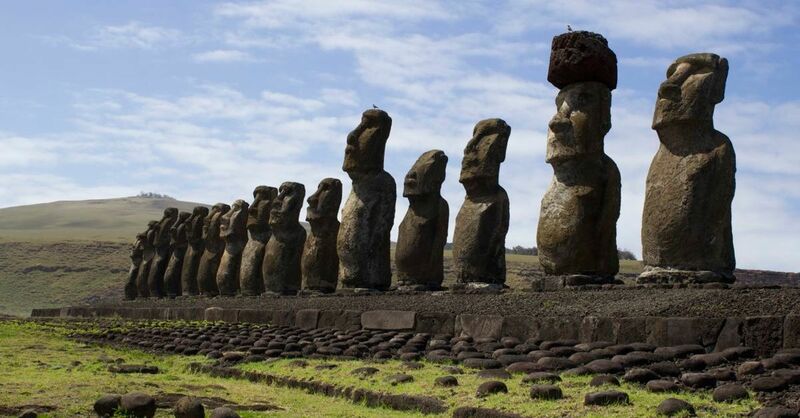 Today, there are 887 moai on Easter Island. Some of them are standing, but many of them are still lying on the ground from when they were toppled centuries ago. Any moai standing on the island today has been restored by archaeologists, often with the use of concrete. Concrete repair in evidence on the neck of the left-most moai at Ahu Vai Ure. Among the moai in Rano Raraku. 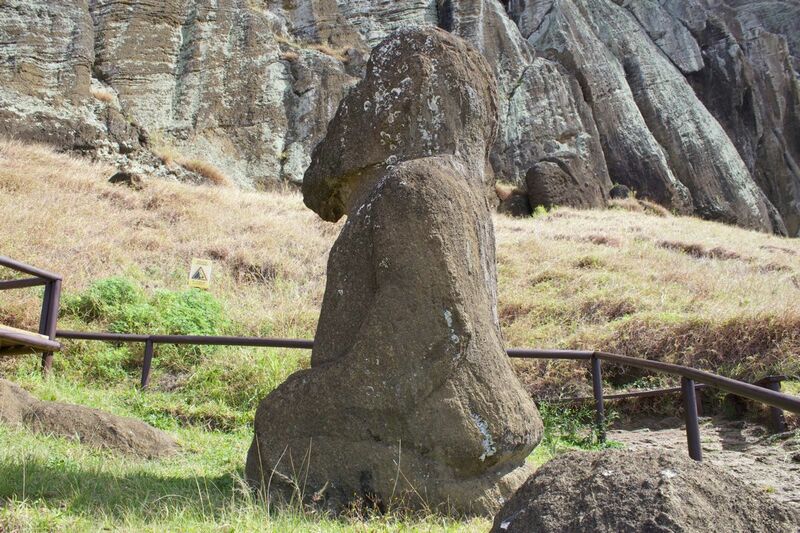 Every moai that can be found on the island were carved from the rock at the island's main quarry at Rano Raraku, and there are still 397 moai that can be seen here in various states of carving. Looking out to sea from Rano Raraku. The moai were hand-carved from volcanic tuff (hardened, compressed volcanic ash) with hand-held carving tools made of basalt. There are a few half-carved moai still embedded in the rock of the quarry. Partially completed moai at Rano Raraku. To create a moai, the carvers first roughed out and then cut the monolith free of the rock before tipping it forward into a large hole where the back of the statue could be completed. Then it was transported across the island, sometimes for long distances, to rest on a platform called an ahu. The moai Tahai resting on its ahu. 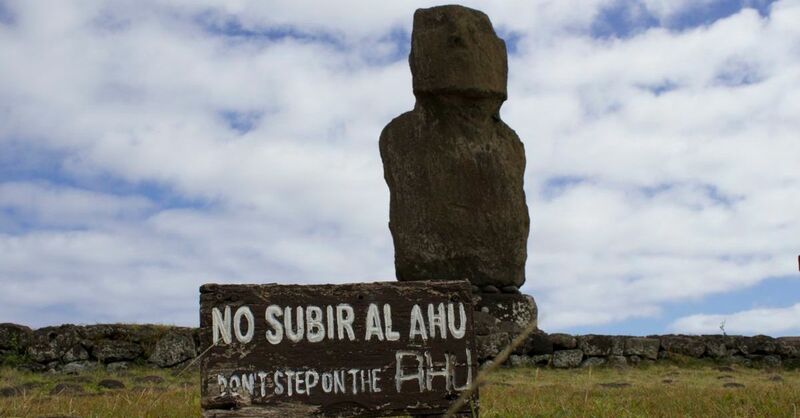 Please don't walk on the ahu. 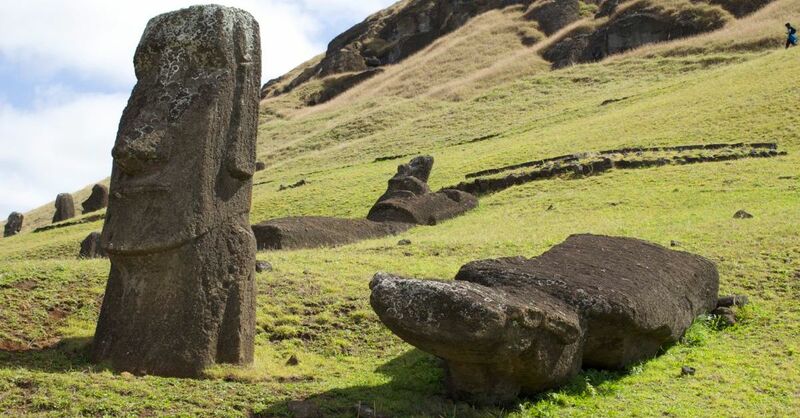 For more information on how the moai were moved from the quarry to their resting ahu, I suggest the paper "Mapping prehistoric statue roads on Easter Island" by Carl P. Lipo and Terry L. Hunt. One of the unfinished moai at Rano Raraku has been dubbed El Gigante (The Giant). If it had been completed, it's estimated that it would have been 22 meters high with a weight of somewhere between 200 and 270 tons. This is also thought to be the last moai to be worked on before the island-wide civil war broke out. 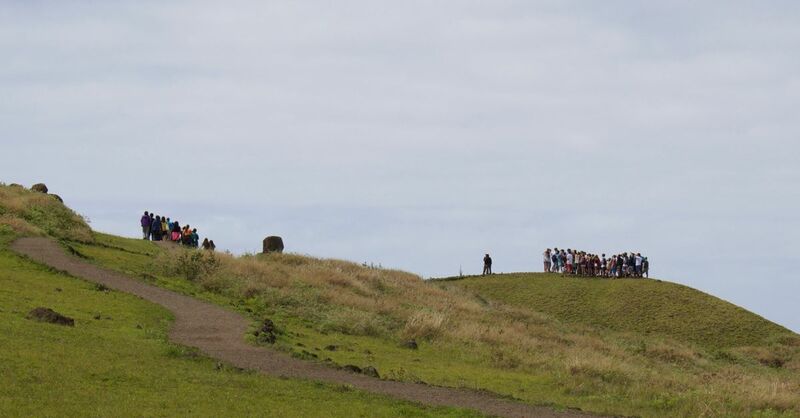 In addition to the numerous iconic moai at Rano Raraku that most people recognize from pop culture, there's one, sitting off by itself, that seems slightly out of place. It's called Tukuturi, and it's thought to be a more recent carving. 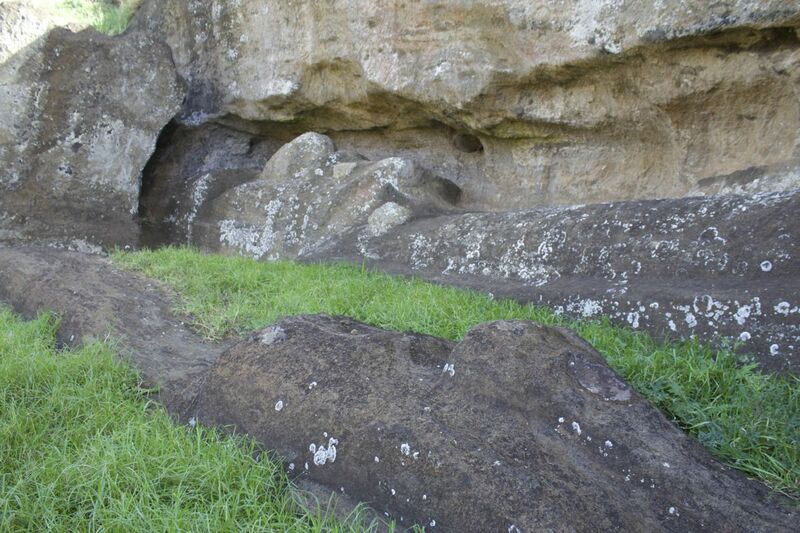 It's made of a different type of stone (red scoria from Puna Pau, another quarry some distance away) than the other moai and has been carved in a seated posture, similar to how men and women would sit while singing during ceremonies. From Tukuturi, looking east, you can see the line of 15 moai that sit on the Ahu Tongariki, one of the most famous Easter Island locations. 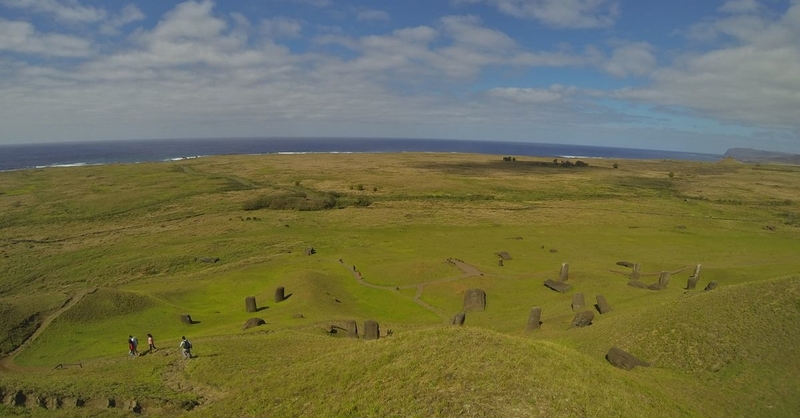 Ahu Tongariki, home to 15 standing moai, is the largest ahu on the island. Notable here, other than there being 15 giant stone heads looking at you, is that one of the moai is wearing a pukao on its head. This moai in the center is sporting a pukao. 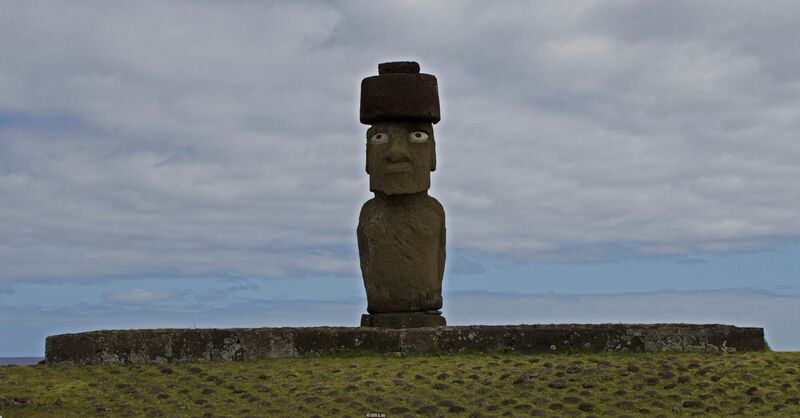 Visitors often call the pukao a hat, but Tiare referred to it a topknot, and it's carved of red scoria, a pumice-like volcanic rock which was only quarried from Puna Pao in an entirely different area of the island. 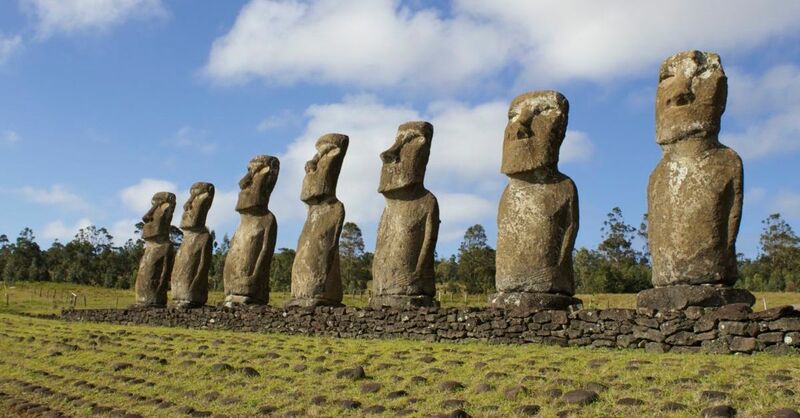 It's thought that all moai wore these pukao when they were erected, and on the ground in front of Ahu Tongariki there are a number of scattered pukao that remain unmatched to any moai. 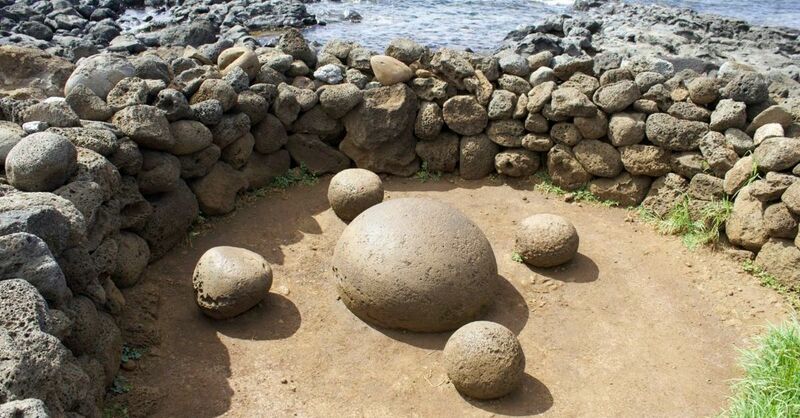 As it was explained to us, unless a pukao was found right next to a fallen moai, it's uncertain where they were supposed to go-and the rocks are too heavy to try to match them up with trial-and-error. The Traveling Moai (or simply the Traveler) also makes its home at Tongariki, though it's not part of the 15 set on the ahu. It earned its name because, in addition to making its initial trip from the quarry, it was used in Thor Heyerdahl's moai walking experiments and also traveled to Japan and back for a world's fair some years ago. It hasn't gone anywhere in some time, but you never know. 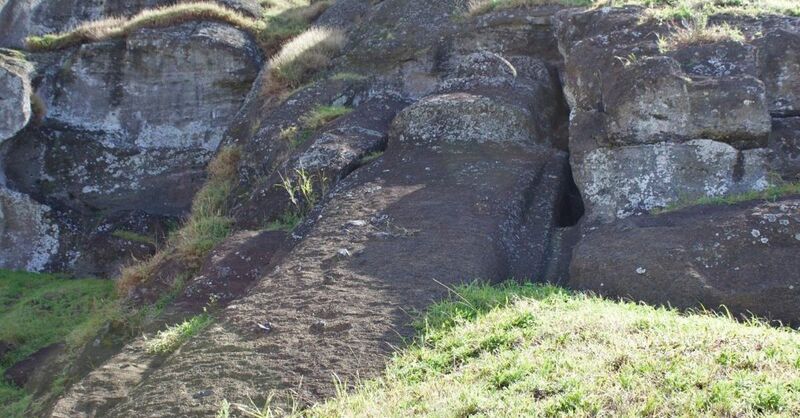 From left, you can see the flat ahu, then the Paro the moai itself, face down, then its pukao. Paro, my second favorite moai, lies face-down in a pile of rocks a short distance from its ahu. It is the tallest moai to have been erected, and in its day, stood 10 meters high and weighed 82 tons. 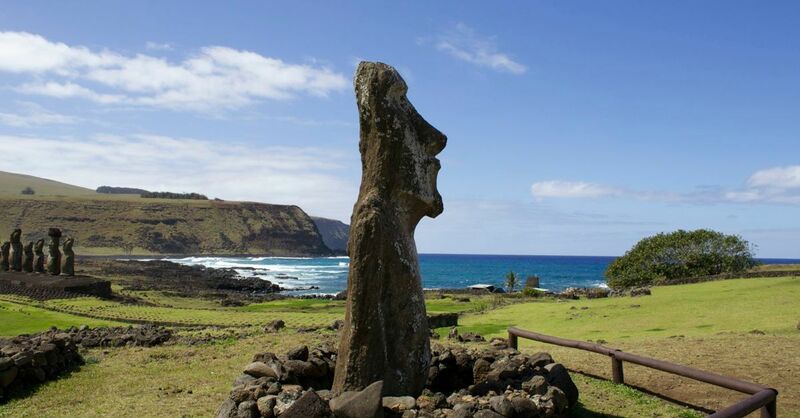 It's been hypothesized that Paro was the last moai to be toppled in the tribal wars, and people suspect that he's one of the statues explorer James Cook saw and wrote about when he visited the island in March 1774. Near Paro, Tiare showed us this smooth, polished rock that's also called the Navel of the World. It's thought to have been brought to the island by King Hotu Matu'a, the first Rapa Nui king, anywhere between 300 to 900 C.E. The king arrived on the island with a pair of canoes and risked a long-distance voyage across the open ocean with a giant rock because it was a source of great mana. This iron-rich rock is well-known for making compass needles behave oddly, and there's no other rock like it anywhere on the island. 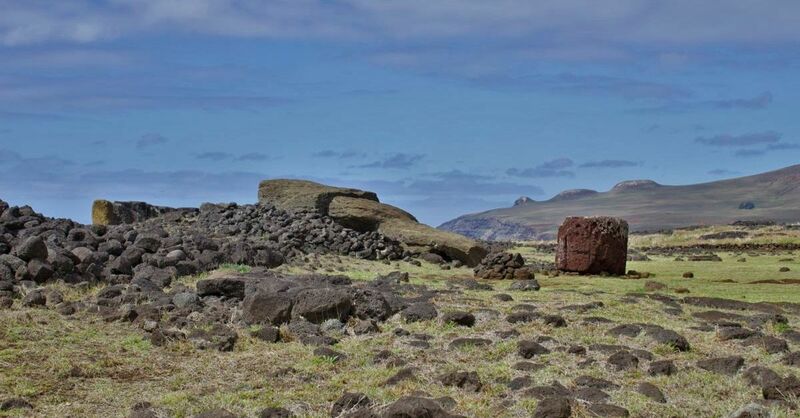 Anakena is notable as one of the potential landing spots of King Hotu Matu'a, and in later years, it served as a gathering point for ceremonies held by the Rapa Nui people. 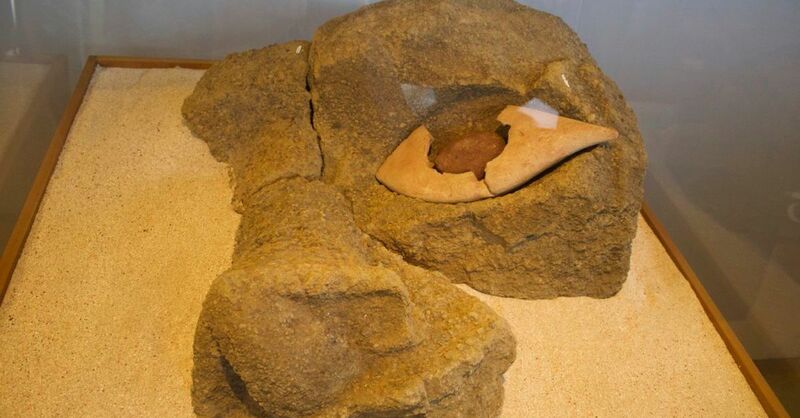 It's also the first place that archaeologists discovered one of the coral eyes that fit into the moai eye sockets (though they didn't know what it was for at first). 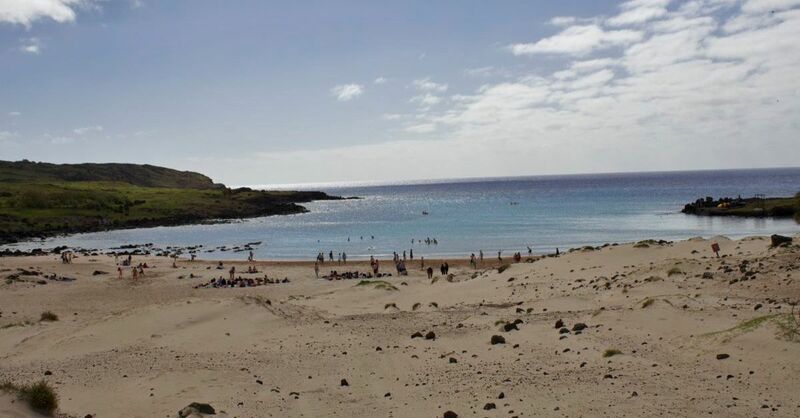 It's the more accessible of Easter Island's only two beaches-the rest of the island's shoreline is mostly rock. The beach is surrounded by palm trees transplanted from Tahiti. While we were there, construction of a series of Polynesian-themed buildings was going on. When finished, which should be "any day now," they told us, it will house the vendors who sell trinkets and the restaurant that's located on the beach. Ahu Tahai in the foreground; Ahu Vai Ure in the background. The site at Tahai has three different restored ahu, including Ko Te Riku, the only moai on the island that is complete with (replica) coral eyes. It looks sort of creepy. Ko Te Riku, looking at you. There's also a replica hare paenga, a traditional Rapa Nui house that looks like an upside-down boat, on display at Tahai. 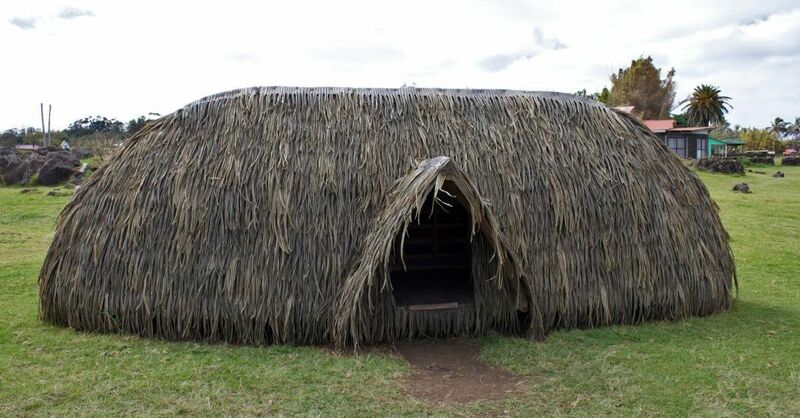 The foundation for these houses was made from black basalt buried in the ground with holes for interconnected wooden support beams upon which a framework of woven reeds and leaves was attached as a roof. 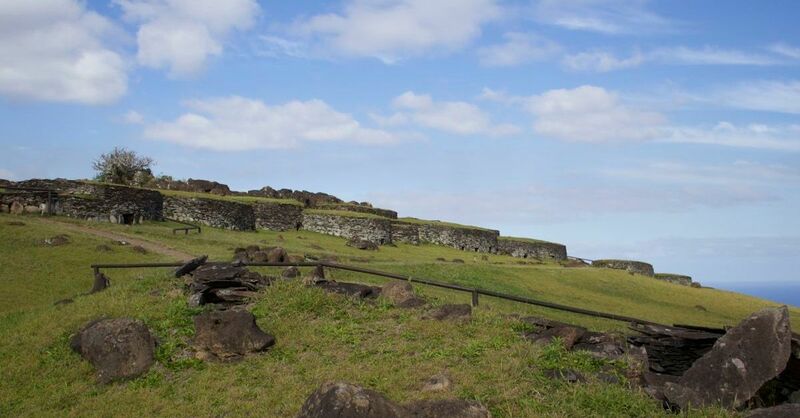 Remnants of these foundations can be seen allover the island, especially at Ahu Tongariki. Replica hare paenga with plastic replica leaves. Just up the road from Tahai you'll find the Rapa Nui Museum, which is a great bargain at 1,000 pesos per adult (kids are free). For a small museum, it's loaded with information about the formation of the island, the history of the Rapa Nui people, and both the moai culture and the Tangata manu, the so-called bird-man cult (which we'll get to in a moment). We took in all the exhibits in just over an hour, and it helped to clarify a few details we'd learned from Tiare and put them in greater context. They also have a display featuring one of the moai coral eyes. 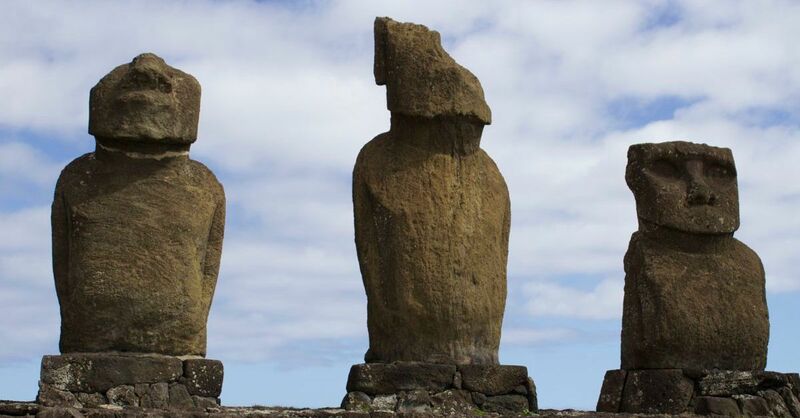 Most of the island's standing moai are located on or near the coastline, but the seven moai that rest on Ahu Akivi are further inland. 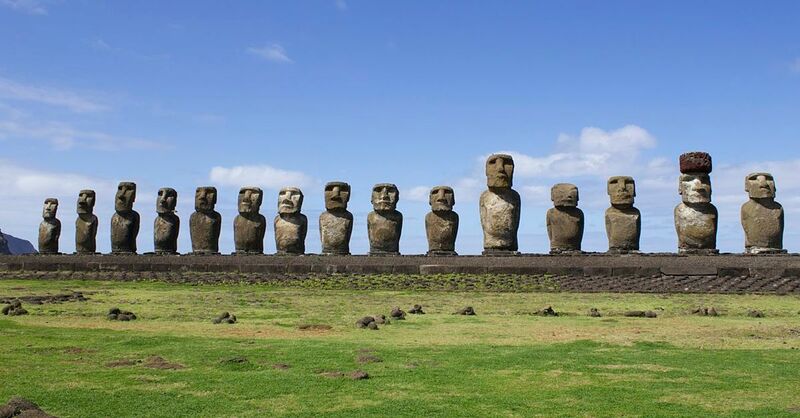 These are the only moai that don't face in toward the land, but rather out to sea. As the legend goes, these seven helped navigators by calming the sea. These were my favorite moai (relegating Paro to second place). I'm not sure why, but this area had a much more calming effect on us than the other moai we'd visited. The vendors here sold some of the better trinkets we'd seen, too. 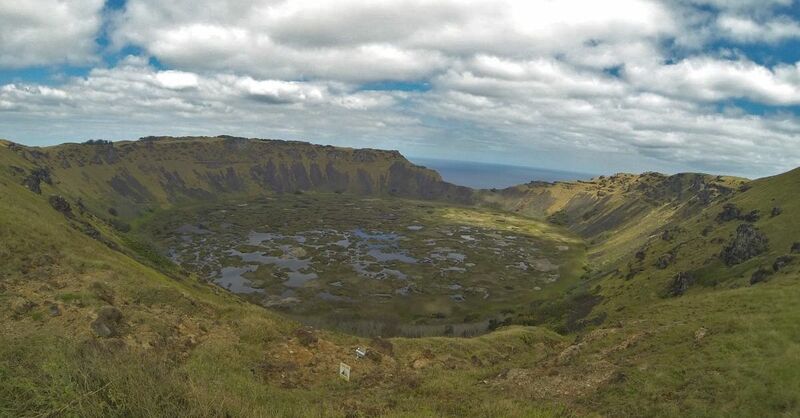 Rano Kau is one of the crater lakes on the island. We'd seen another one earlier at Rono Raraku (the quarry), but this crater was a lot deeper. And while the one at Rono Raraku looked pretty much like a small lake, Rano Kau looked almost like an alien landscape. We'd learned in the museum that Rano Kau was the second volcano to erupt, eventually leading to the formation of the island. The first was Poike on the island's opposite end, while the the third (and largest) was Terevaka, which dominates the northern side of the island, neither of which are accessible with a powered vehicle. Reconstructed cliffside stone houses at Orongo. The giant heads on Easter Island get a lot of press, but not so much the Tangata manu, the bird-man cult, which was at least as fascinating. Tangata manu developed at the end of the moai era, and even possibly alongside it. I'm not sure why it's considered a cult, other than the archaeologists who first discovered and excavated the site found it sort of strange. And yeah, it was a little weird, but is it any weirder than worshiping giant stone heads? The bird-man cult held an annual ritual competition at Orongo to see which competitor (usually each tribal chief or a designated representative) could gather the first egg laid by a sooty tern (which they called the manu tara) on Moto Nui, a smaller island just off Easter Island where the terns nested every spring. The contestants raced down the cliff (some of them falling to their deaths) and swam to the island to claim the first egg and bring it back to Orongo. The winner (or the chief he represented) was declared the Tangata manu, was given sacred status, and spent the next year in seclusion. Moto Nui (larger island) and Moto Itu. Moto Nui was the island the bird-man contestants would swim to in order to retrieve the egg of the sooty tern. 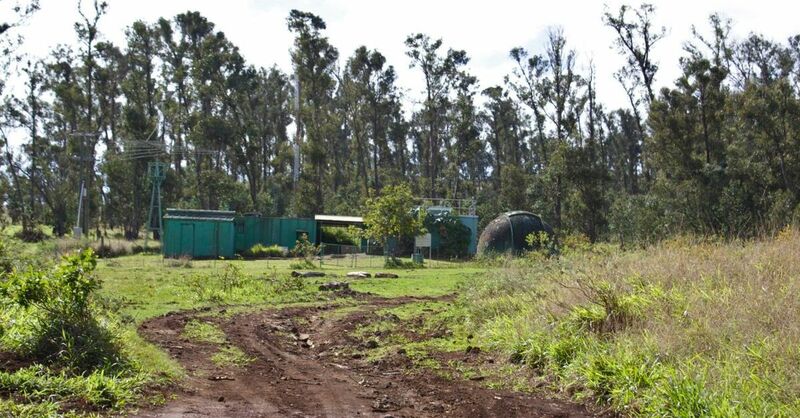 NASA outpost on Easter Island. Lastly worth mentioning is NASA. In 1987, the runway at Mataveri Airport was extended as a possible abort site for the space shuttle. Although the shuttle never landed here, there's still an old, run-down NASA outpost on the island, which is possibly the eeriest thing we saw while we were there. Real secluded mad scientist laboratory stuff. We've found you can't really leave Easter Island behind. Since our visit, we still think about the moai quite a bit. There's something majestic and memorable and still very mysterious about them. So few things in life, especially those that loom large on the cultural stage, meet the expectations attached to them. But the moai on Easter Island deliver on the majesty they promise. They are awesome, in the truest sense of the word. 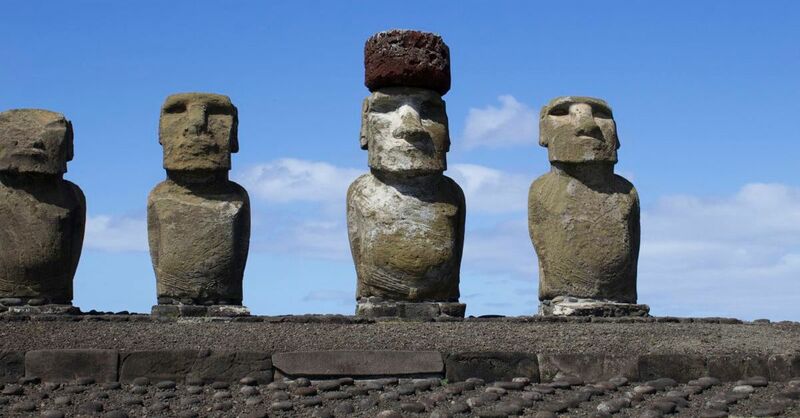 So if you, like me, have long been fascinated by this small island in the Pacific with giant stone heads, go visit them. The trip really is worth it. Read all of Tom's posts about his around the world family adventure. I’ve really been enjoying the new ‘MythBusters Jr’, Adam Savage’s new science exploration show featuring… kids. Really smart awesome talented kids. Adam Savage will be Tweeting live during tonight’s two premiere episodes, and they start airing an hour early (at 8 pm ET) for parents with wee ones. Baby Ryan doing manly things. Yes, please.